Hereford United have taken two unnamed strikers on trial as possible cover for key forwards who are carrying injuries. Boss Simon Davey has confirmed Matthieu Manset and Sam Malsom are both battling to be fit for the game against Rotherham on Saturday. "One played in the reserve game against Coventry and scored," said Davey. "He has got a lot of experience behind him but it would take time to get international clearance so there is no rush to make that decision." He added: "I will have a look at the two of them in the next two practices and see how they cope with the training." Manset has missed training this week because of a hamstring problem while youngster Aidan Thomas is also sidelined. The Bulls boss says his squad is still evolving and admits he is fortunate to have a chairman in David Keyte who appreciates the situation. 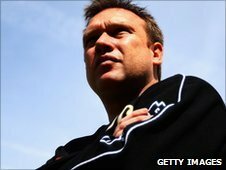 "I am looking at options and I won't stand still so if I think we need to add to the squad, I will go to the chairman and say 'I think we need to do this'," he told BBC Hereford and Worcester. "He is a chairman who is very understanding and who sees what I see." Davey knows some supporters will look at the statistics for United's season so far, as they have only scored one goal which came from defender Janos Kovacs. "Sometimes people panic and look at the statistics a little too closely," he said. "We had Stuart Fleetwood hit the post at Chesterfield, and Sam Malsom hit the post against Colchester. "The chances are being created - I would have a little bit more concern if we had been conceding goals left right and centre and we weren't creating chances.